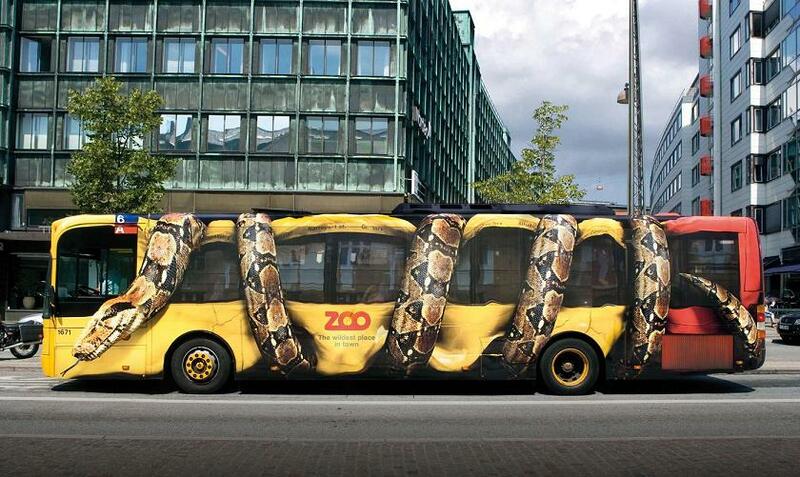 Collection of the "Best Zoo Advertising Campaigns" from all over the world. 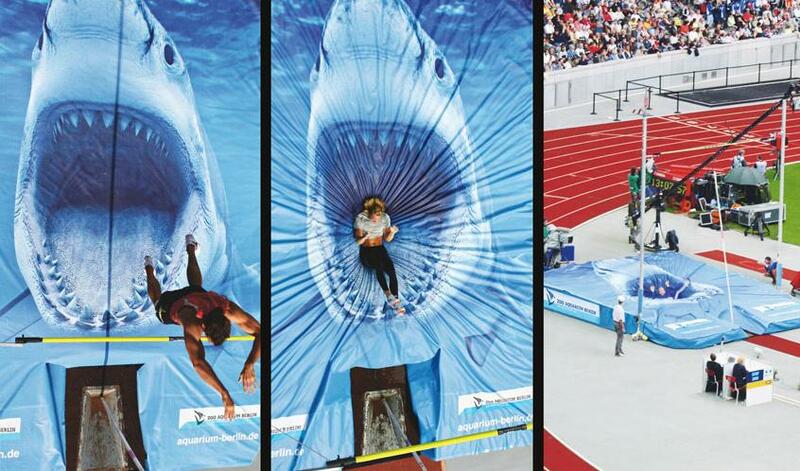 Zoo Berlin Shark Mat Advertisement: Zoo Berlin Shark Mat Advertisement was displayed at international pole vault meeting near Berlin. The mat featured a shark with its jaws open so the viewers can feel the excitement of visiting the zoo. 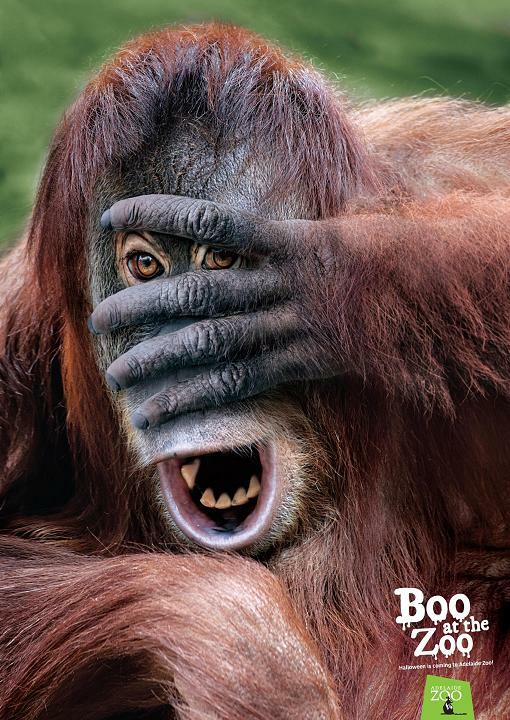 Zoo Safari Sticker Advertisement: The idea behind this advertising campaign was to get the message across to the future visitors that Zoo Safari isn't a common zoo; it's a lot more like a safari where animals roam without restrictions. 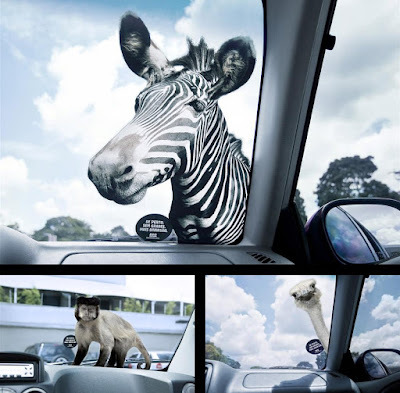 To get the message across, electrostatic animal stickers were created that were placed on the windshield of the parked cars to make the future visitors imagine what it would feel like to be close to these animals. What more, these stickers were created in real life size proportions to the face of an animal taking a peek inside the car. 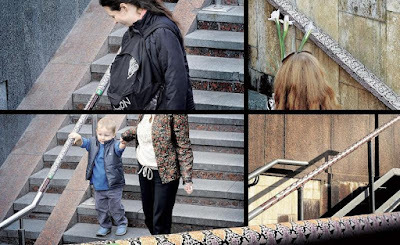 Kyiv Zoo Reptiles Handrail Advertisement: The idea behind this creative ambient advisement was to make Kyiv Zoo Terrarium popular again as going to zoo and taking kids there became unpopular. These handrails were designed to get people's attention, what more these reminded the people about the forms of terrarium's native inhabitants. 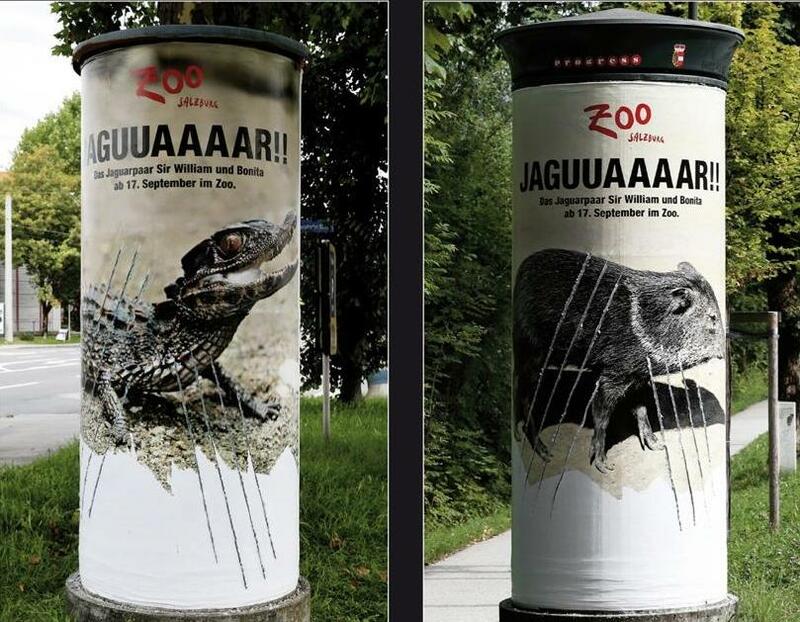 Salzburg Zoo JAGUUAAAAR Advertisement: This advertisement was created to welcome the new jaguar couple in the Salzburg Zoo. For the advertising campaign a pillar was designed with wild claw marks. It's on rare occasions that you can view jaguars in real world and most of the other times you do find their marks. 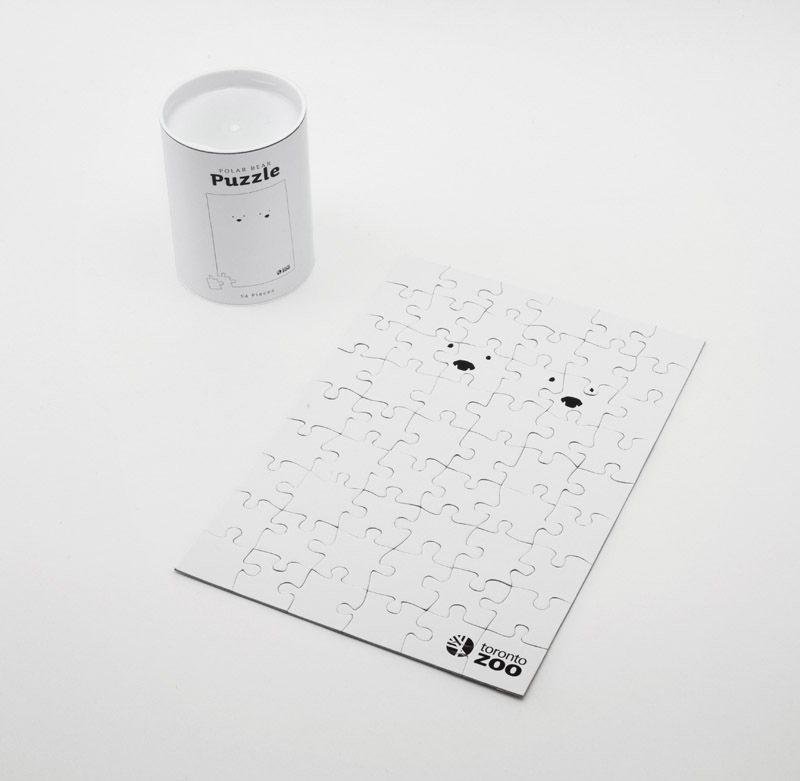 Toronto Zoo Polar Bear Puzzle Advertisement: This Toronto Zoo Polar Bear Puzzle Advertisement creatively puts the real life facts to use. Did you know that a polar bear's skin is black and even their fur is not white either? Their hair are clear hollow tubes, and these look white because the way their fur reflects the natural light. It allows them to blend into the arctic and keeps them warm. 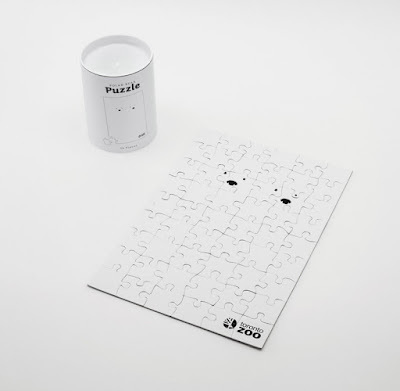 If you didn't solve the puzzle, the hint is Polar bears have no fur on their nose, and their eyes are black. Copenhagen Zoo Snake Bus Advertisement: The Copenhagen Zoo Snake Bus Advertisement features a giant constrictor snake squeezing a Copenhagen city bus. 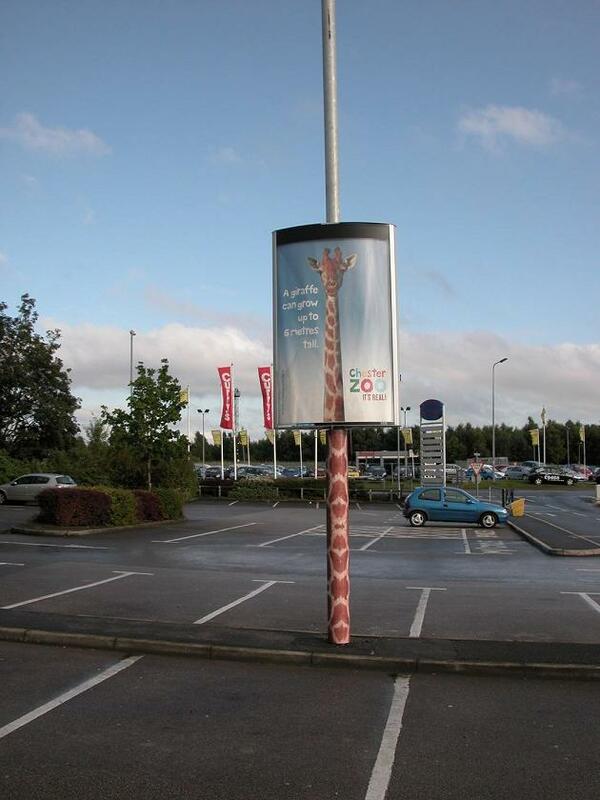 Chester Zoo Giraffe Advertisement: The Cheater Zoo's ambient advertisement uses the poles creatively with a caption: " a giraffe can grow up to six meters tall". Calgary Zoo Pram Advertisement: There is something wrong with this pram, did you happen to see its height? Ohhh wait a minute it's a baby giraffe's pram. Did you know that a baby giraffe stands six feet tall at time of birth? 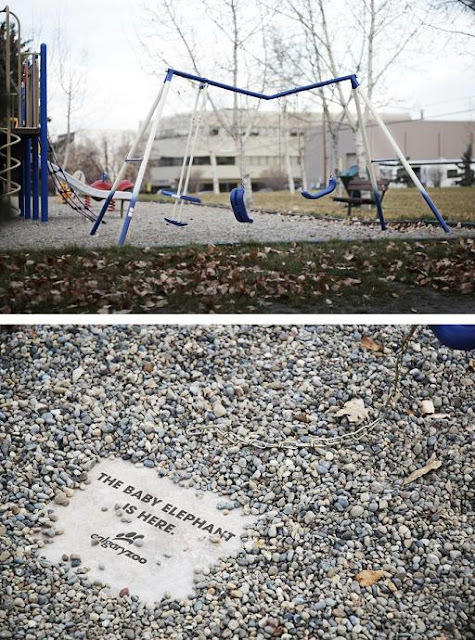 This pram is a part of ambient advertisement of Calgary Zoo and with a caption: "The baby giraffe is here". Calgary Zoo Scratch Post Advertisement: The Calgary Zoo Scratch Post Advertisement features a scratch post with a caption: "the baby tiger is here". Calgary Zoo Swingset Advertisement: An ambient advisement of Calgary Zoo that displays a broken swingset with a caption "The baby elephant is here". Salzburg Zoo Crosswalk Advertisement: An interesting take on the usual crosswalk. 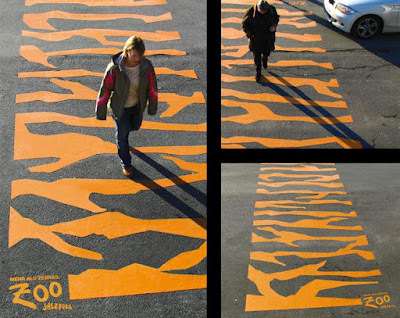 The standard crosswalks were replaced with this newer version that featured yellow stripes from the animal kingdom 'tiger' with an accompanying text: more than zebras. Salzburg Zoo. Adelaide Zoo Orangutan Advertisement: This orangutan advertisement is a part of Boo at the Zoo outdoor advertising campaign of Adelaide Zoo. Tree of Life - Disney's Animal Kingdom Park. 12 Awesome Paintings on Coins. reTyre - The Next Generation Tyre. Garage Transformed into a Mini Home. 12 Best And Unique Business Cards. Most Amazing Elevator Optical Illusions. Artist Turns Simple Pumps Into Awesome Art. 12 Best Sleevefaces You Didn't Come Across.